President, General MacKenzie Enterprises Inc.
Lewis MacKenzie was born in Truro, N.S. a long time ago. He is a graduate of Xavier Junior College of Sydney N.S. and the University of Manitoba. During his thirty six year military career he served nine years in Germany with NATO forces and managed to avoid service in Ottawa by fitting in nine peacekeeping tours of duty in the Gaza Strip, Cyprus, Cairo, Vietnam, Central America and Sarajevo. In 1990 Lewis was appointed commander of the United Nation’s Observer mission in Central America. Two years later he was assigned to the United Nation’s Protection Force in Yugoslavia. In May of that year he created and assumed command of Sector Sarajevo and with a small contingent of soldiers from 31 countries opened the Sarajevo airport for the delivery of humanitarian aid during the height of the Bosnian civil war. As a result he became the first Canadian, military or civilian to be awarded a second Meritorious Service Cross. Since his retirement from the military, Lew has been under contract to CBS and CTV and frequently appears on many of the international TV and radio networks as a commentator on international affairs. He is a regular contributor to the Globe and Mail and is in demand as a lecturer on the subject of leadership. Lew is still active in motor racing having won national and provincial titles in sports car and formula car racing commencing in 1979. He was the 2010 Quebec – Ontario interprovincial champion in formula ford racing. He continues to compete in formula mazda and formula ford series in Quebec and Ontario. Lew was made an Honourary Chief of the Metro Toronto Police Force in 1993. He holds Honourary Doctorates from numerous Canadian Universities, is a member of the Board of Advisors of the Canadian Federation of AIDS Research and sits on a number of corporate boards with international interests. 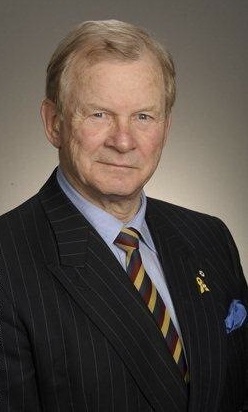 Following the attacks of 11 September 2001 General MacKenzie was appointed one of two advisors to the Primer of Ontario on counter-terrorism and emergency measures. In 2002 and 2006 respectively Lew was invested with the Order of Ontario and the Order of Canada for his humanitarian work in Africa. In spite of the above, Dora MacKinnon of Baysville, Ontario is still married to the General. Their daughter Kimm works, rides and resides in Ottawa.